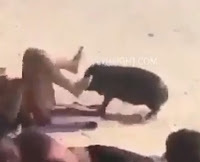 Tuesday, March 26, 2019 - This poor woman was having a good time on the beach when the randy animal decided to embarrass her. The swine was strolling by the beach and when it got near the lady, it did something crazy. The woman’s reaction when the animal decided to look for something to eat between her legs is just priceless. Now you know why pigs are known to have a phenomenal sense of smell..